Optometrist Eye Doctor inside the Santa Rosa Costco | Dr. Bradley I. Hall, O.D. Dr. Bradley Hall, O.D. is the main optometrist eye doctor for the independent optometry office in the Santa Rosa Costco. He is here for you whether you are looking for a thorough eye exam for glasses, contacts, LASIK or eye health concerns. 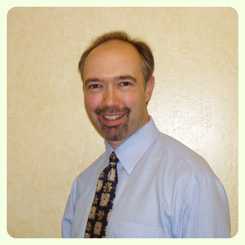 Dr. Hall graduated from the University of California, Berkeley School of Optometry with honors. While there he received the Dean's Award for Optometry Research. Dr. Hall is one of the few eye doctors with a Diploma in Gerontology -- the study of how we all age from birth through the older stages of life. His background in Gerontology education is expanded with continual review of new clinical research on how the aging process affects us all. Please view our page on preventive eye care. While in the Seattle area, Dr. Hall completed a preceptorship with a retinal specialist in order to gain experience in the diagnosis and management of retinal problems such as glaucoma, diabetic retinopathy, macular degeneration and retinal holes, tears and detachments. Doctor Hall is very experienced in fitting Contact Lenses, including for Myopia Control. He has had the LASIK procedure done himself, and now sees 20/20 without the need for glasses or contact lenses. This personal experience and broad professional education in pre- and post-LASIK care has helped many patients with their Laser Vision Correction. Dr. Hall looks forward to serving you with friendly, professional and comprehensive eye care. If you need further information or would like to schedule an eye exam, please call our office at (707) 570-2418. Please note that you do not need to be a Costco member to be examined by our optometrist, and that other optometrists are usually available to provide eye exams in our office on the days when Dr. Hall is not scheduled to see patients.